From Gulf State Park, Gulf Shores, Alabama November weather along the Gulf coast can bring anything from hot, humid and sunny days to to cold rain and/or freezing temperatures. Our time here was nice overall, although we did have one strong storm that lasted most of two days. It brought plenty rain and winds that almost took our slide covers off. In near, but certainly not precise, chronological order, here's some of what made early November 2015 memorable. 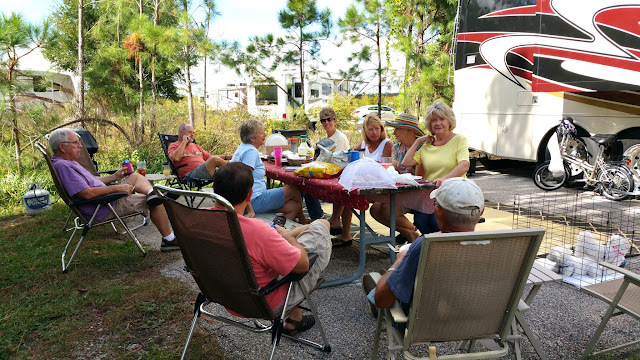 A total of five more couples joined us in the campground at one time or another. 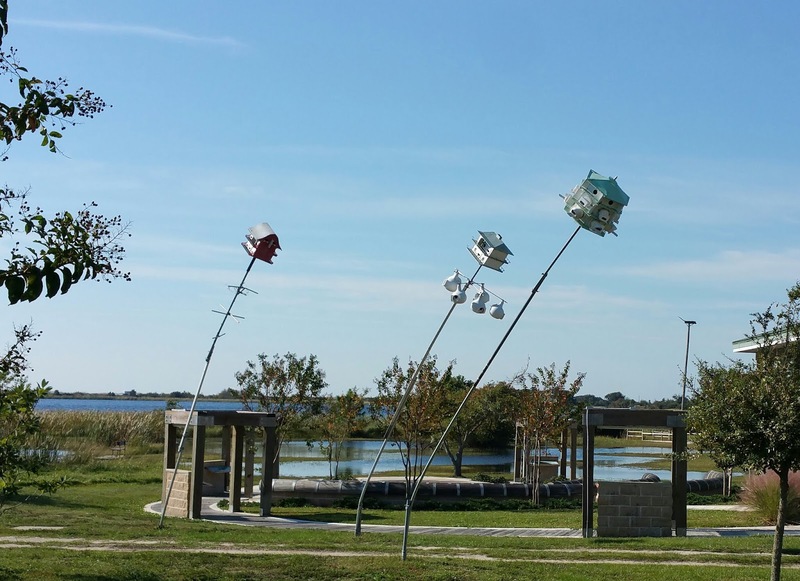 At least one other couple was camped nearby, at Silver Sands RV Resort. My friend who lives in Panama City visited for a few hours too. We also have old work related friends living nearby though we didn't get to see much of them. All in all, we made lots of good memories. The selfie stick I bought last summer hasn't been used much but I'll want to operate it with confidence at some point, so I've begun to practice taking "selfies". I've been reading tips on how to take flattering shots. The photo below is not one of them. 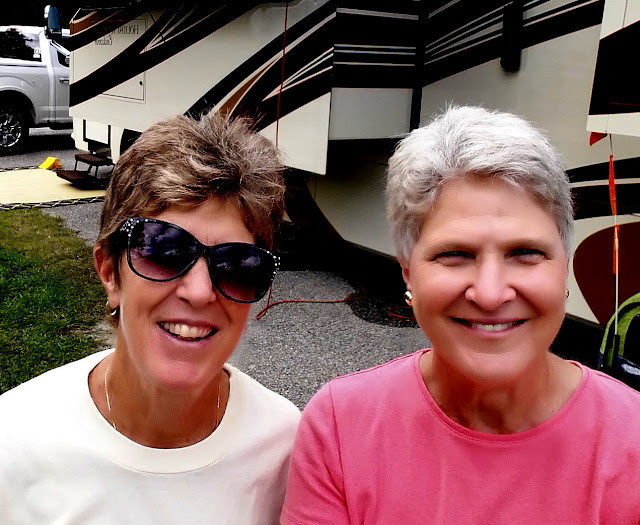 Pam and me, learning to use the selfie stick. Holding the camera high is recommended for more flattering shots. I'm concentrated on the mechanics of selfie taking and forget to smile. Happens a lot. More selfie practice (Pam (age 12), me and Joyce (age 13) Trying to learn to keep the stick out of the picture. At this point in time, I haven't figured out how to reverse the photo so things aren't a mirrored image. Notice my NRUBUA (Auburn spelled backward) shirt. Pam, Ernie, Wayne and I have what we think is a good winter travel plan. It takes us west to southern California for winter then north in spring and into Alaska next summer. 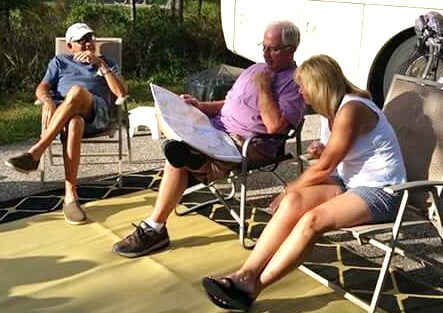 In the photo below, Pam and Charlie review the routes. My good friend, D.J. stopped by for an afternoon visit on her way east from Dallas where she's just celebrated her granddaughter's birthday. None of us had any way of knowing DJ would come down with flu the next day. She planned to return the for the Dolphin Cruise with our group. Of course, that plan was thwarted. Sore throat and high fever kept her down for several day. DJ and me. More selfie practice. I'm remembering to smile, at least. We planned a picnic for the day DJ stopped in. At this point, Pam and Ernie, Charlie and Joyce, Linda and Dale and Fran and Mary all were here -- Ned and Rachel are on the way. 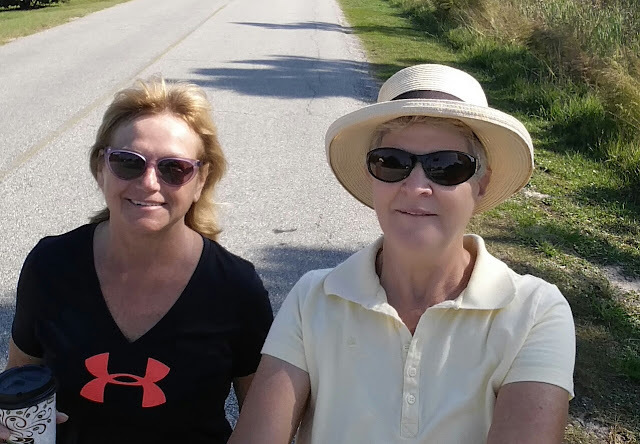 DJ (sunglasses) in the center of the picture with Pam, Linda and Joyce on the bench beside her. Mary is on the other side. Counter clockwise, Wayne, Charlie, Fran and Ernie. Lexie and Ozzie in their pen to the right. The same afternoon DJ stopped in, we had another couple drop by for a visit. Janet and Dennis are at Sugar Sands RV Resort here in Gulf Shores for a few weeks. 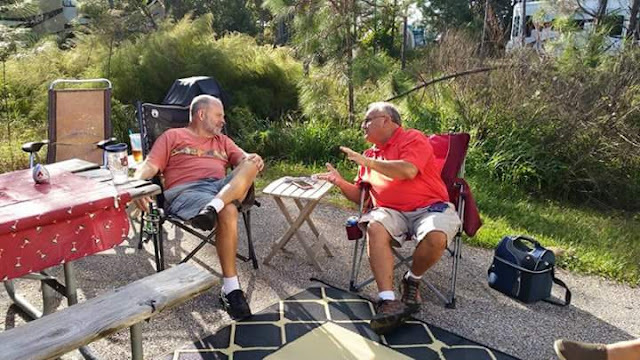 They are also friends we made at Seminole Campground in North Fort Myers. Looking back, it's plain to see that Seminole was a very friendly place. 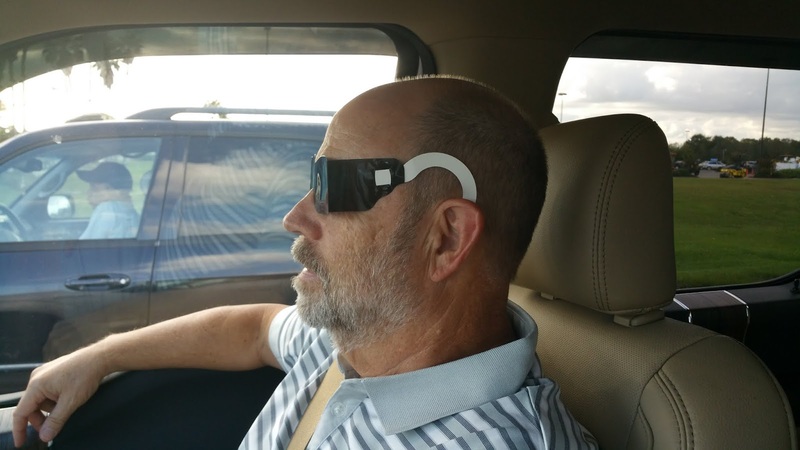 Dilated eyes mandate fashion eyewear. 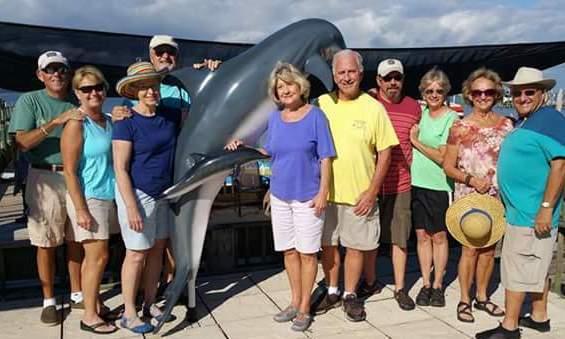 The group took the afternoon Dolphin Cruise the day after our picnic. Wayne's eye appointment was scheduled that day and I'd need to drive while his eyes were dilated. 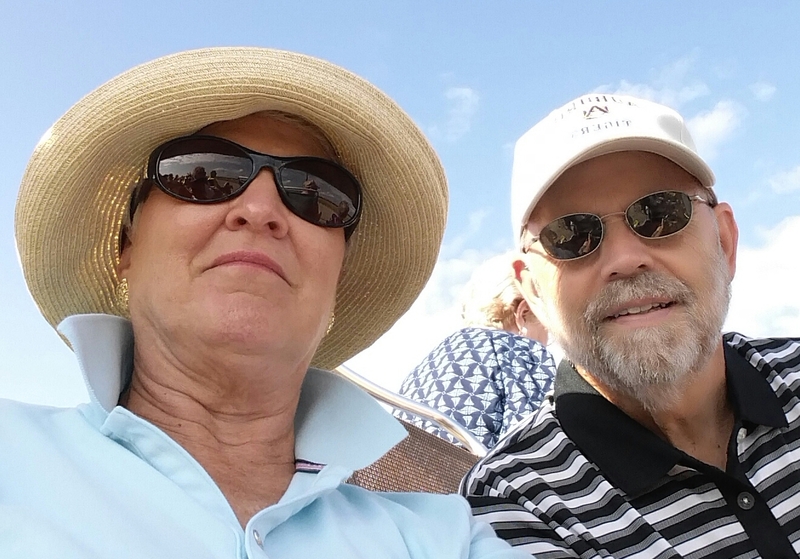 I'm told they had a good time on the cruise and saw some dolphins. At the dolphin cruise location. 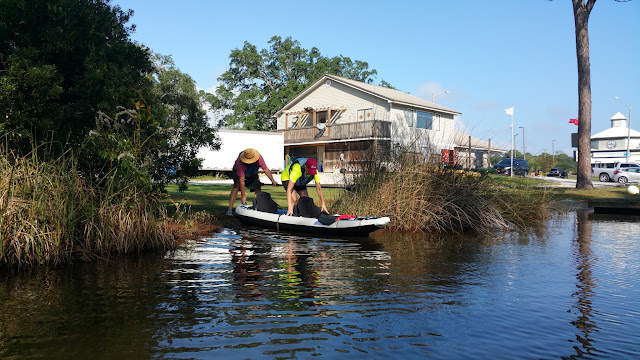 Another day a few of us went kayaking. Naturally, eating would be part of that activity too. 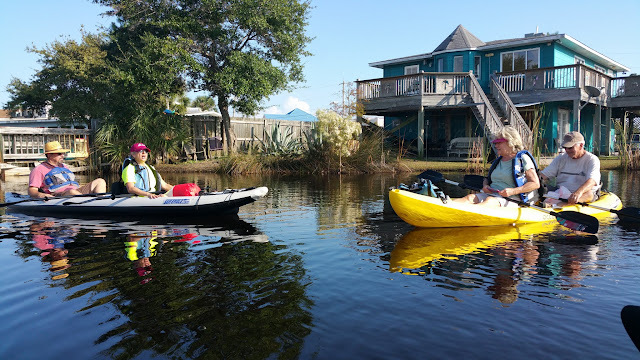 We stopped in for poboys at The Flying Harpoon in Gulf Shores before renting kayaks for our backwater adventure. Just another seafood dive, the Flying Harpoon boasts a kinship to New Orleans with their poboys. 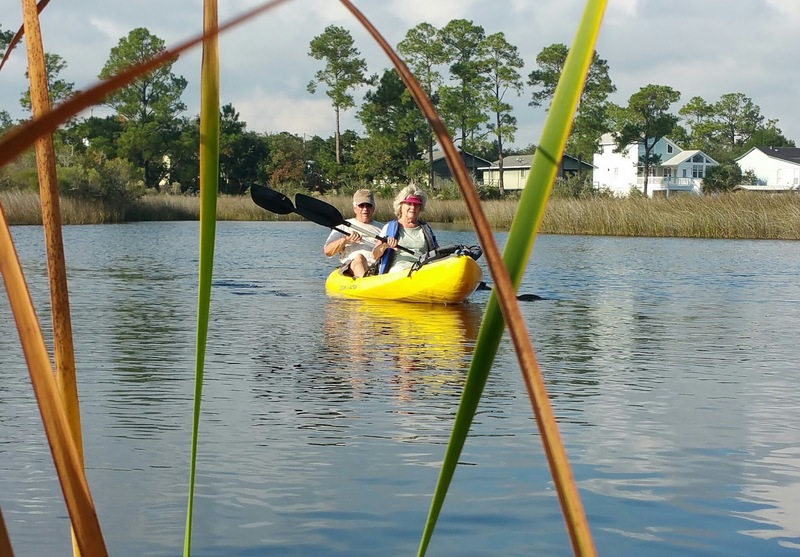 Fran and Mary bought themselves a kayak over the summer and they were anxious to get the maiden voyage underway. Wayne and I doubled as did Joyce and Charlie. The weather was surprisingly nice and we had a good afternoon. Fran and Mary launching their new inflatable kayak. Joyce and Charlie sneaking through the tall grasses. 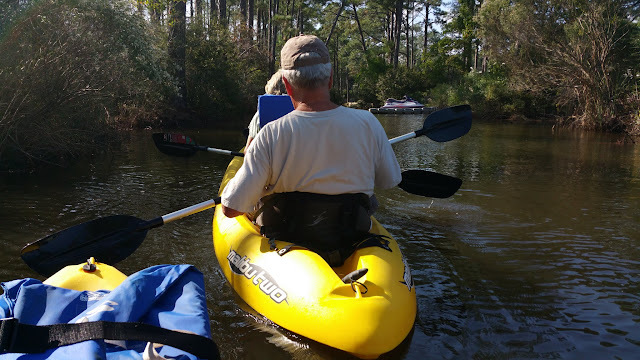 Charlie and Joyce ahead of Wayne and me in the brackish water. This canal will take us out into a lake where we'll take another canal. Fran and Mary on the left. Joyce and Charlie on the right. The Flying Harpoon (where we'd just had lunch) is in the aqua colored building. Sadly, we brought no cash so the pina colada I hoped to enjoy did not materialize. Gulf State Park is a biker's delight with miles of trails over mostly level to rolling terrain. 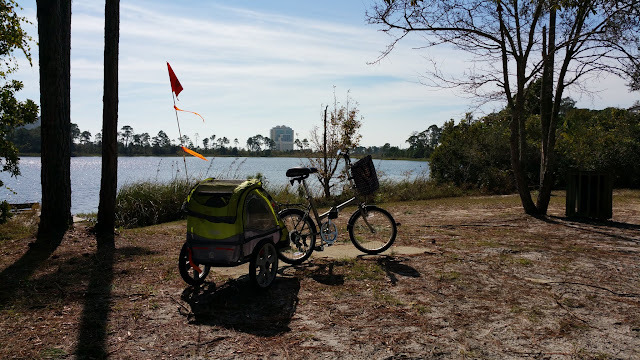 Unfortunately, I didn't get in as many bike rides as I would have liked, but one pleasant afternoon, I loaded Lexie and Ozzie into their carrier and we had a good outing. My bicycle with the carrier attached. 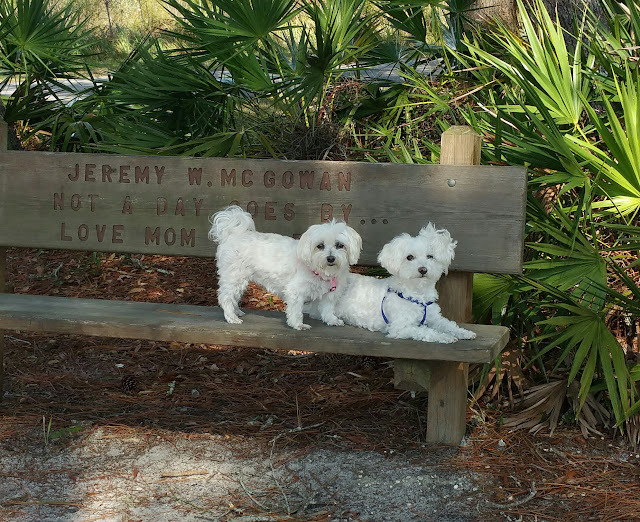 We stopped for a little leg stretching, pee-pee break. Lexie and Ozzie. Moments after this picture was taken, Lexie fell off the bench but was not hurt. 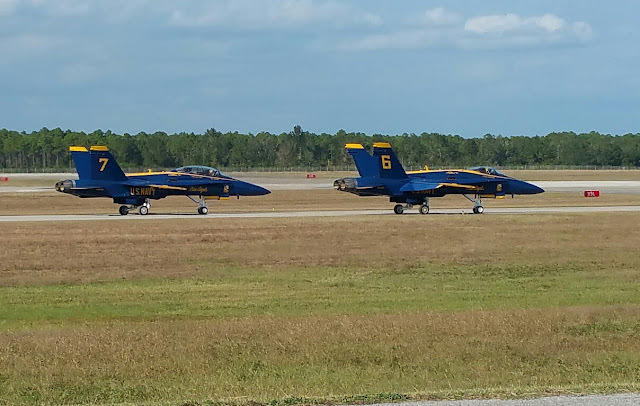 Linda isn't feeling well enough to spend a hot afternoon sitting on an asphalt parking lot, so she and Dale didn't go with us to the Pensacola Naval Air Station to see the Blue Angels practice. Ned and Rachel will arrive this afternoon. Linda and Dale will welcome them and have dinner. 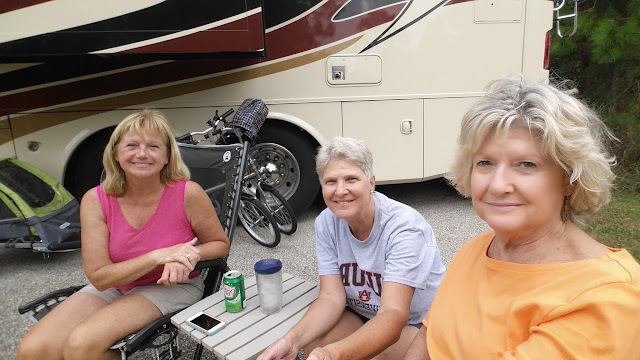 More selfie stick practice. 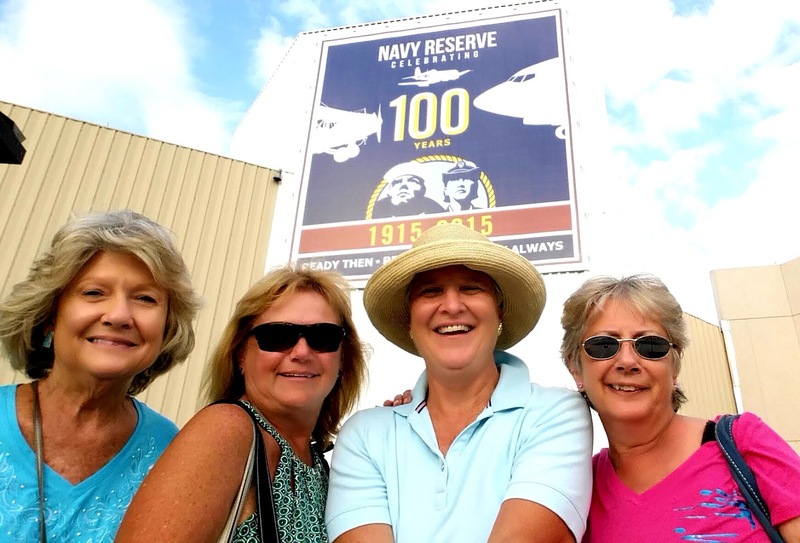 This time with Joyce, Pam, me and Mary at the Pensacola Naval Air Station. I have learned how to reverse the mirrored image. Selfie without the selfie stick. Forgot to smile again. The 2015 Naval Air Station Pensacola Blue Angels Homecoming Air Show is scheduled for November 6 and 7. Our practice date was the Wednesday before the show. 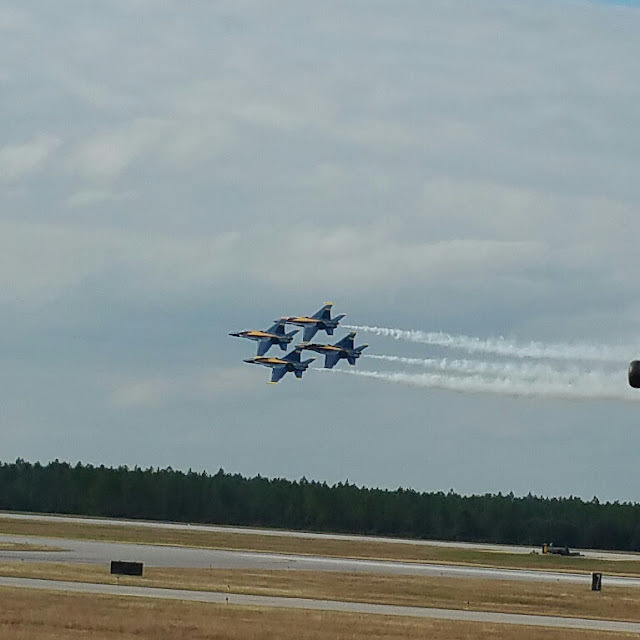 The Blue Angels practice was modified the day we were there because clouds rolled in. High maneuvers were replaced with low, fast ones. It was great and we had a blast... eating lunch at the museum just before the practice began. Joyce, Charlie, Pam, Ernie, Wayne and I sat in lawn chairs on the asphalt tarmac. Fran and Mary sat on their bleacher seats and probably had a bit better views. It was super warm and muggy humid. 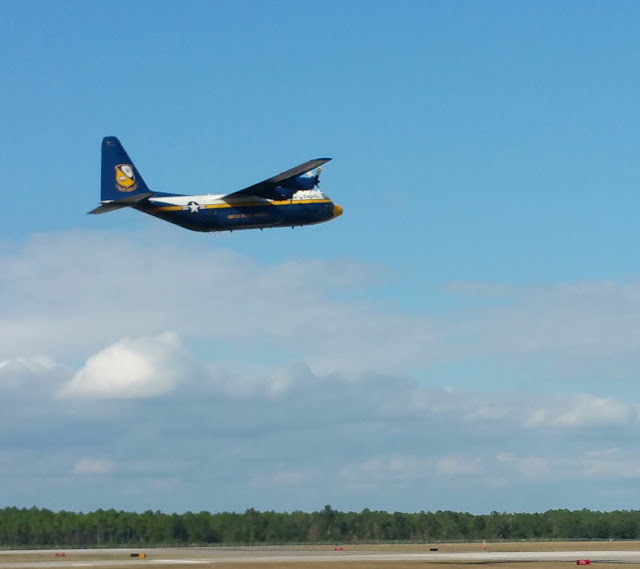 This plane is called "Fat Albert" and it's part of the Blue Angels team. It carries a bunch of payload. 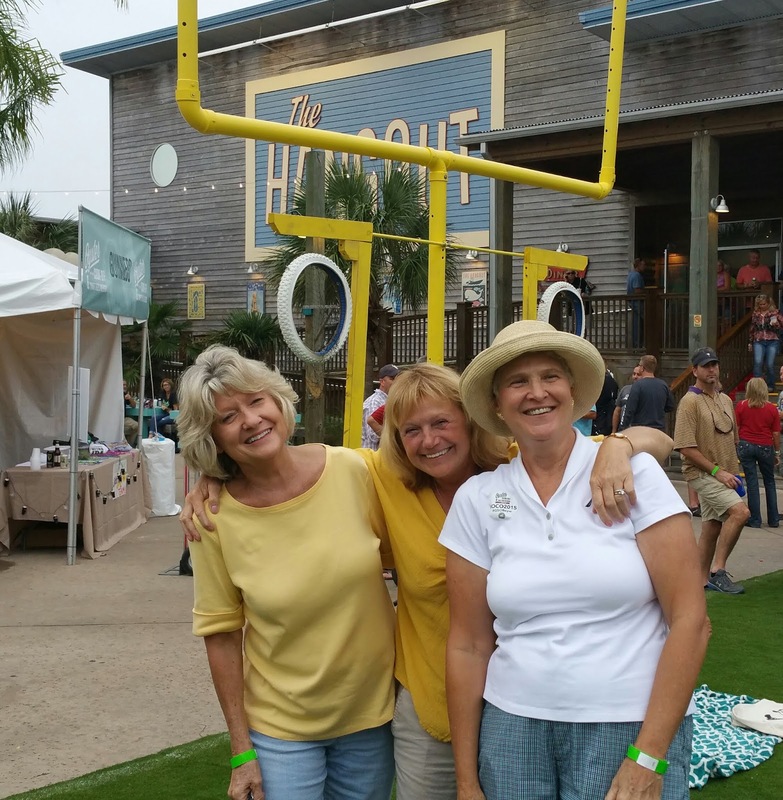 A local Gulf Shores bar known as "The Hangout" hosts an annual Oyster Cook Off. Joyce, Charlie, Pam, Ernie, Wayne and I attended this year. 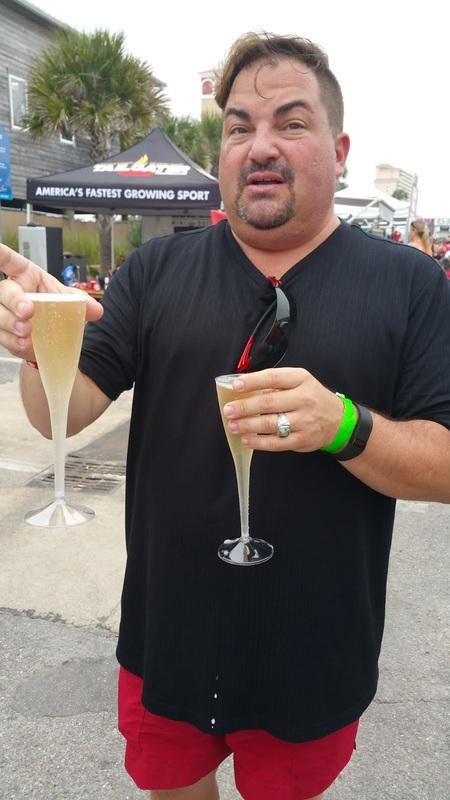 Over 60 craft beers were served along with oysters on the half shell cooked every way imaginable. 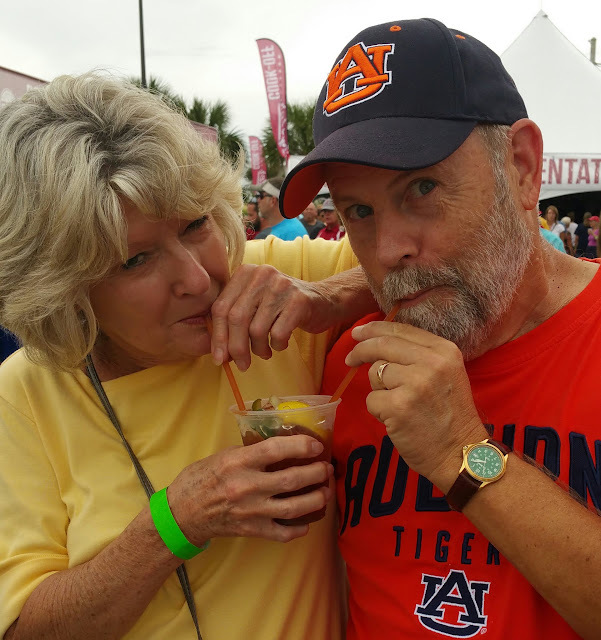 Joyce and Wayne share a vegetable, cheese and meat filled Bloody Mary. 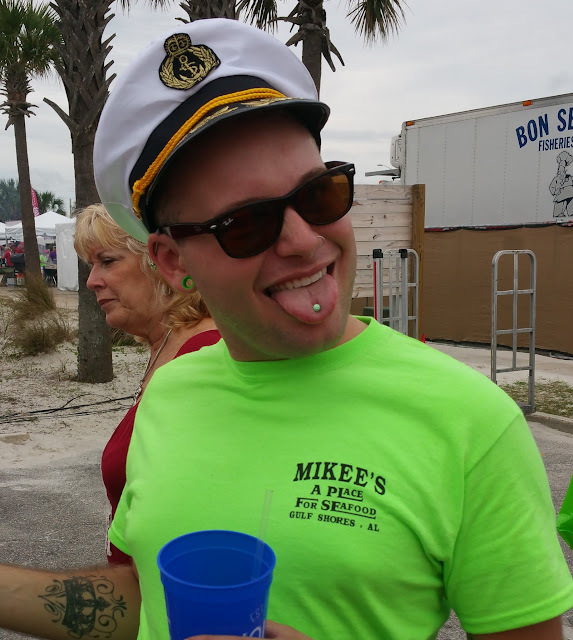 The Hangout's Oyster Cook-Off attracted chefs and "chef wanna be's" from all over, some of whom, were, I suppose, celebrities. The woman in the center in this picture is well known, I'm told. I don't remember her name, but Joyce says she hosts a program on one of the cooking networks. All I know is that her socks didn't match. 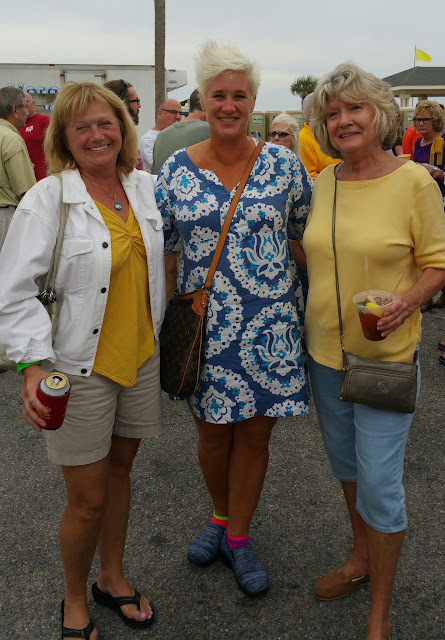 Pam and Joyce rubbing elbows with celebrity. The cost for this little afternoon oyster nibble totaled almost $100 for Wayne and me. $10 each to get in and a book of 15 tickets was $25. We nearly starved eating a single oyster at a time in exchange for the precious tickets. we finally found our way into the restaurant for an assortment of drinks and appetizers shared between us. That tab came to nearly $50. Go on... do the math. One of the most interesting parts of "The Hangout" is this DJ booth. 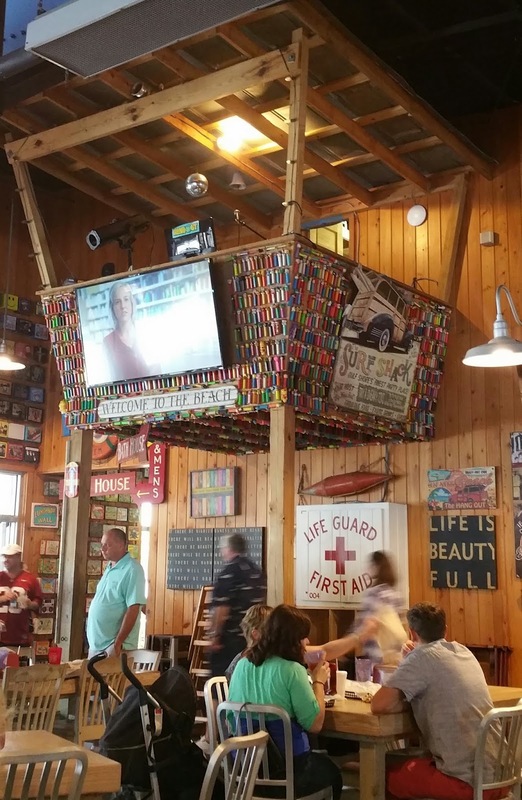 It's covered in PEZ dispensers. After a half dozen oysters and almost that many cocktails. This guy gave $5 Shrimp Basket gift cards to each of us. 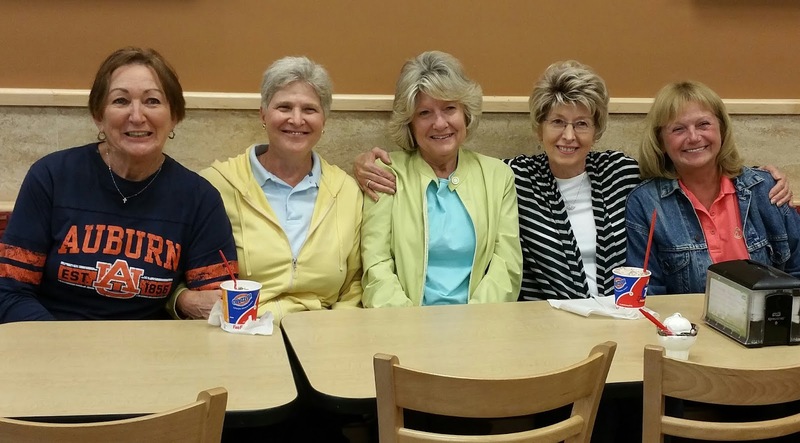 Our group can't get together without at least one trip to the local Dairy Queen. 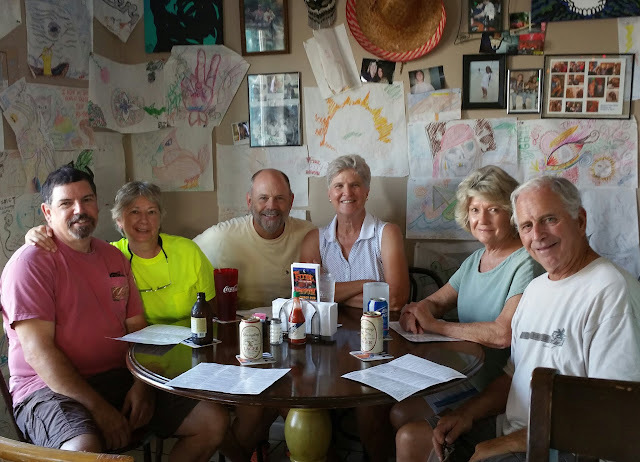 We stopped in after dinner at least twice in Gulf Shores. The night this photo was taken, five couples were together for our farewell pizza night at Rotolo's. Fran and Mary had already departed and I think this was the night just before Rachel, Ned, Linda and Dale would be leaving. By the time Veterans Day rolled around, our group was reduced to three couples. Several restaurants were offering complimentary dinners to veterans. All our husbands served in the military so we took advantage of the freebies, eating at Applebee's in Gulf Shores. Later we stopped in at the American Legion in Foley where we suffered through thick cigarette smoke long enough for a drink and a few laughs. Veterans Day American Legion in Foley ... cough, cough. Joyce, Charlie, Pam and Wayne. Ernie was at the bar making friends. Barely visible is the wall phone that became a good conversation piece for us. 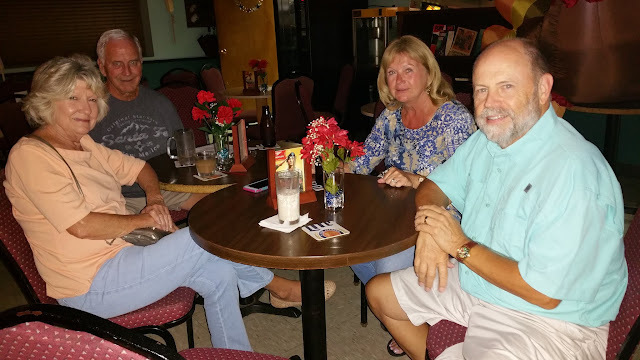 Gulf Shores' American Legion is a non-smoking facility so we stopped in there too, for a drink and a few more laughs. I found myself enjoying White Russians and just about everything else. Pam and I sang along with the very bad karaoke that night and planning a return the following Tuesday for dinner and line dancing lessons. The flyer indicated the lessons were for beginners to intermediate line dancers. 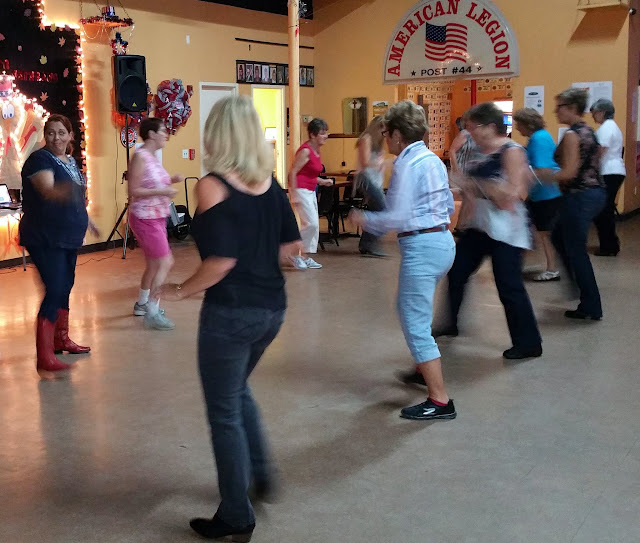 I never mastered aerobics and was skeptical about line dancing, but agreed to give it a try. Tuesday night rolled around and we arrived early enough to eat dinner. 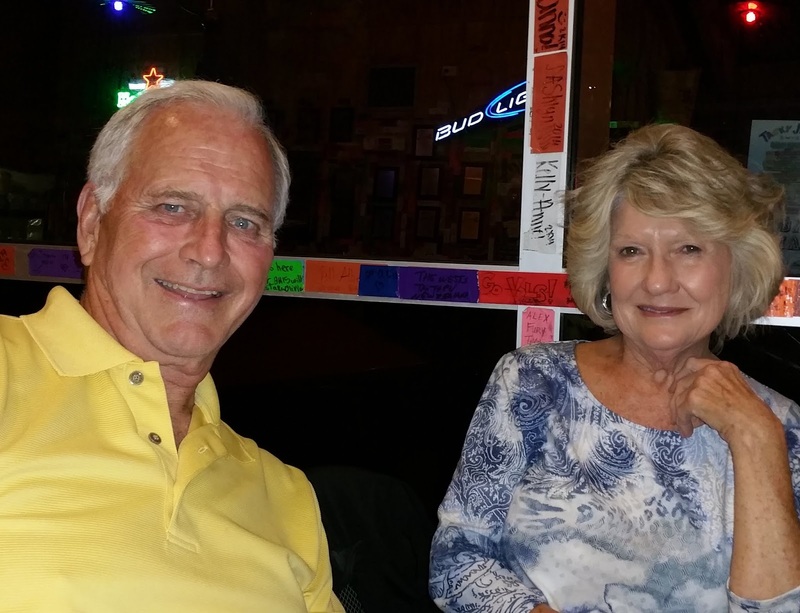 Shortly after, we began watching small groups of ladies and some men arrive for line dancing. When the lesson started, I realized it was not a lesson at all... just a little review of the dance steps and then the music started and the dancing began. These people all knew one another and were having a great time. Of our group, only Pam could line dance. We all, including our husbands, went to the dance floor, but we quickly returned to our seats, leaving just Pam to dance. Later, Patricia, Art, another Pam and Jim, friends of Pam and Ernie, stopped in. No surprise... those ladies could line dance too. Our dancing queen... Pam and her friend, also named Pam. I hate them because they dance. I cannot. When we left the line dancing lesson, we stopped in at Tacky Jacks. It was just 8 p.m. after all. To our amazement, there were almost no customers. The lack of tourists has been very noticeable this visit. I know that many northern and Canadian visitors come here for winter but I guess it's too early yet for them. 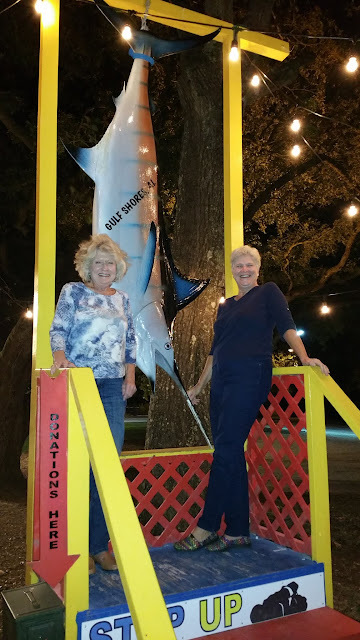 We took our seats at one of the patio tables at Tacky Jacks, ordered appetizers and drinks and enjoyed the nice evening. Colored duck tape pieces with personalized captions adorn almost every square inch of this building and we spent a fair amount of time reading those around us. The weather is breezy but comfortable. One last silly photo to be taken at the display sailfish in Tacky Jack's parking lot.